TIME’S CHILDREN, the first book in The Islevale Cycle, my new series from Angry Robot Books, will be released in just six days (10/2). 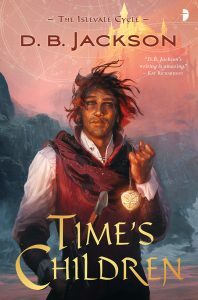 This is an epic fantasy/time travel story, and I have a post up at the blog of my friend Alma Alexander that is all about writing time travel books — the pitfalls, the challenges, the rewards. I hope you’ll check out the post. There are two new reviews of the book online, both of them very positive. You can find them here and here. And Black Gate Magazine has a preview up as well. Tomorrow, Thursday, September 27, my blog tour promoting the release continues with a post at the site of my dear friend Stephen Leigh. Again, I will be discussing the writing of time travel. On Friday, September 28, I will be visiting the blog of friend and wonderful writer Stina Leicht. My post for Stina’s blog is about world building for the Islevale series. On Monday, October 1, I’ll be doing a Q&A with fellow Angry Robot author Patrice Sarath at her site. Tuesday, October 2, is release day, and I’ll have an essay up at Black Gate — a continuation of my “Books and Craft” series, on key craft elements of classic books. I’ll be discussing Ursula K. Le Guin’s Earthsea Trilogy, which has long been one of my favorite works. In fact, I intended my world for this new series, Islevale, as an homage to Earthsea. Wednesday, October 3, I will be doing another Q&A, this one with another friend, Bradley Beaulieu. And on Thursday, October 4, I will be at the site of Joshua Palmatier, author and editor extraordinaire, as well as the founder of Zombies Need Brains. Joshua and I have worked on several short fiction projects together, and I wrote a story for him that is set in Islevale. The story is called “Guild of the Ancients.” It appears in GUILDS AND GLAIVES, and anthology Joshua co-edited with S.C. Butler. This entry was posted in Angry Robot Books, Appearances, Business of publishing, Fantasy, Friendship, Islevale Cycle, Novels, Publicity, Publishing, Time's Children, Writing, Writing Life and tagged Alma Alexander, Angry Robot Books, Black Gate Magazine, blog tour, Bradley Beaulieu, D.B. Jackson, David B. Coe, Islevale Cycle, Joshua Palmatier, Patrice Sarath, reviews, Stephen Leigh, Stina Leicht, Time's Children, writing, writing life. Bookmark the permalink.